Enjoy being footsteps from The Payne Stewart Golf Club and Clubhouse, and minutes from all the excitement that Branson has to offer by staying in one of our three lodging options at Branson Hills. You are certain not to be disappointed. Come stay with us in Branson Hills, and have the best Branson vacation possible! Shop, dine and play at Branson Landing and then retreat and relax in sophisticated Branson hotel accommodations at Hilton Promenade at Branson Landing hotel. Stay in one of our Luxury 2,3, or 4 bedroom units footsteps from the Payne Stewart Golf Club and minutes away from shopping, dining, and attractions. Attractions include the Branson Recreational Park (Branson RecPlex) and Branson Landing with over 100 specialty stores and restaurants and a $7.5 million fountain show! 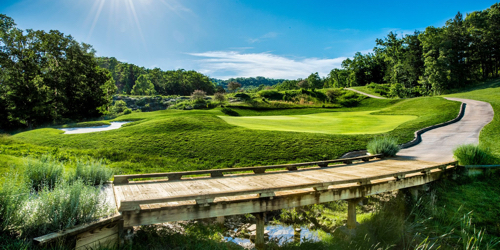 Branson Hills Golf Club reserves the right to change price and offer at anytime. Prices and offer are subject to change without notice. GolfMissouri.com is not responsible for errors posted in this golf package.